Advertising Opinions: Tata Nano – What's Awesome About It? Tata Nano – What's Awesome About It? advertising, so let us analyse a few of the ad campaigns of Tata Nano seen so far.. In the above TV commercial, seen during the early days of Tata Nano, claims made were (1) 21% more space, (2) ease of driving and manœuvrability, (3) SUV like high ground clearance, (4) excellent air-conditioning, (5) best petrol mileage in India – 25 kmpl and (6) short turning radius of 4 mts. That is quite a laundry list. In this post I will call this ad - product feature ads. In the ad below Tata Nano has been presented as an affordable car which owners of four-wheelers can aspire for. There are at least two more ads where Tata Nano has been pitted against two-wheelers. In both these ads the two-wheeler riders are shown taking notice of the happy couple/family in a Nano. Here are the links on YouTube: (1) Tickle (2) Family on scooter. Hereinafter I will refer to these ads as Nano v/s two-wheeler ads. and the ‘cheapest’ tag stuck to the brand though they never said so in their ads. According to what has been reported the sales performance of Tata Nano has been below expectations, it appears that the ‘cheapest’ car tag is not working in its favour. It was intended for the two-wheeler owners, urging them to upgrade to Nano but it seems many of the two-wheeler owners prefer not to replace their two-wheelers with a car that has been branded as the ‘cheapest’. It is not entirely true that Tata Nano has been totally rejected by people; we do see a few Nanos on Indian roads, some may have been bought by those who would have otherwise used two-wheelers and some use the Nano as a second car; the problem is that the numbers of Tata Nanos sold are far too little. One of the reasons for poor performance, to my mind, is that the Tata Nano ads have not worked well to drive sales although the product does have its uniqueness and plus points. 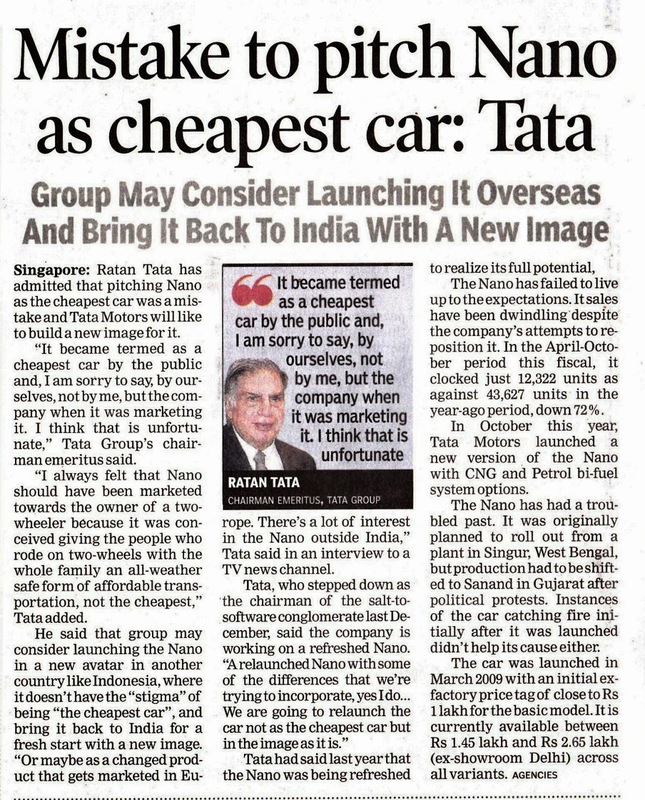 The launch ad itself was quite lack lustre, it was pretty subdued and practically makes no proposition to the target customer – the customer is not presented with any good reason to buy Tata Nano. In the Nano v/s two-wheeler ads once again no strong reason is given to the two-wheeler owners to change to Nano. Whatever message these ads contain are not presented effectively. The manner in which the message is conveyed is too subtle for people to take notice. 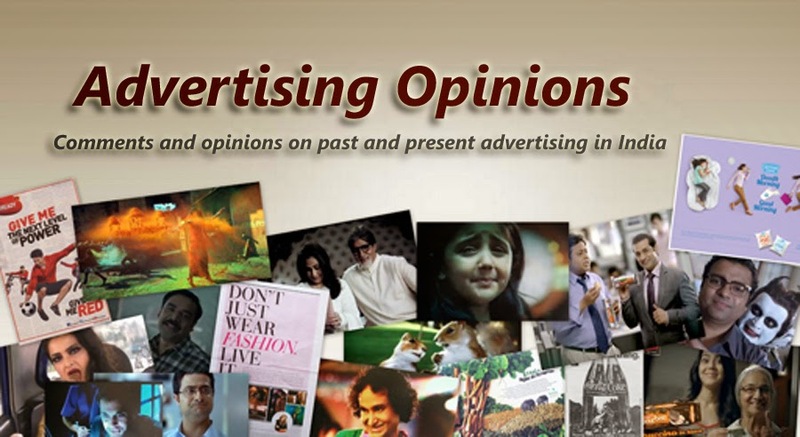 An ad is supposed to create an urge in the prospective customer to buy or consider buying the product but that is not happening with Tata Nano ads. The product feature ad was an effort in communicating the various benefits to the customer, but in this ad far too much information is being communicated, so nothing much registers in the minds of the customers. 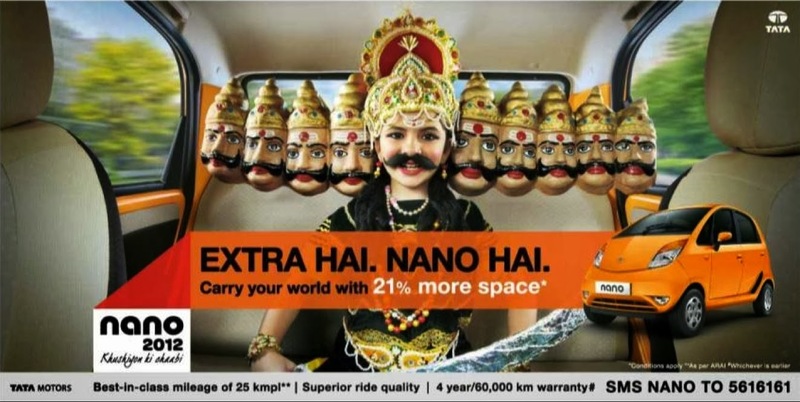 The ads talk about ‘21% more space’, but how many people will believe that a tiny car can offer 21% more space? As for Tata Nano’s 25kmpl claim, I think with the ‘Kitna Deti Hai?’ campaign Maruti Suzuki has created a strong position for itself as a fuel efficient car, it will be difficult for Tata Nano to dislodge them from this position. Coming to the current ‘Awesome’ campaign; this is an effort in removing the stigma of the ‘cheapest’ car through imagery. The ad associates Tata Nano with young adults, giving it a trendy image with excitement, colour and magic all around. As a film it is undoubtedly very good with high production value but as an ad it does not do enough to sell Tata Nano. In this ad too I do not see any good reason to buy Tata Nano, there is nothing in the ad to support the claim that it is ‘awesome’. All you see are lots of people running around, dancing around, performing stunts and there are lots of visual effects and colour. At best this ad can work as a reminder that Tata Nano exists in the market. It is the most affordable car to buy in the Indian market and it also performs pretty well. Although it is a small car it is surprisingly spacious inside thanks to its design and engineering. Seating is quite comfortable and offers sufficient head space. It offers a very clear view of the road ahead. Easy to drive, park and manœuvre on congested city roads. Tata Nano gives you value for money. aware of all the benefits Tata Nano has to offer, that would include value-for-money. I do not think that subtle suggestions as in the Nano v/s two-wheeler ads will work, nor will all the song and dance and magic of the ‘Awesome’ campaign is going to work for the brand, what is very important is that the facts or product benefits must be properly communicated to the target customer. It is not possible to communicate too much information in one TV commercial; it will therefore have to be supported by press ads and other forms of communications where the details can be presented effectively; in other words car customers must effectively receive the communication and understand it well, Tata Motors and its agencies must sure of it. The new campaign must have a different look and feel – that of confidence and authority, well this is my opinion, do you agree with it?